A person whom Teresa had never met showed up at her home one day with a remarkable offer. Teresa and her family would receive what amounted to a year's income, in cash. Nothing was owed in return. She did not have to repay the money, and her family could spend it however they wished. Teresa was at a loss. "We did not believe someone would give us that kind of money without having worked for it." But then the money came. This scenario has played out thousands of times. The organization behind the money, GiveDirectly, is not broadly known. They have spent very little to market their work; their Facebook page has just over 7,000 likes. Yet, dollar-for-dollar, analysts say GiveDirectly is among the most effective organizations in the world trying to eliminate extreme poverty. Some of its strongest champions are two of Facebook's co-founders. And in the spirit of Silicon Valley, GiveDirectly's work is data-driven and transparent in ways that are virtually unheard of in the aid world. For donors who want their giving based on evidence-backed results, few organizations compare. How it works. GiveDirectly transfers about $1,000 to very poor families over the course a year. It makes no rules or even suggestions about how to use the cash. Since launching in 2011, the group has distributed about $15 million to communities in Kenya and Uganda. These are not the poorest countries in the region. 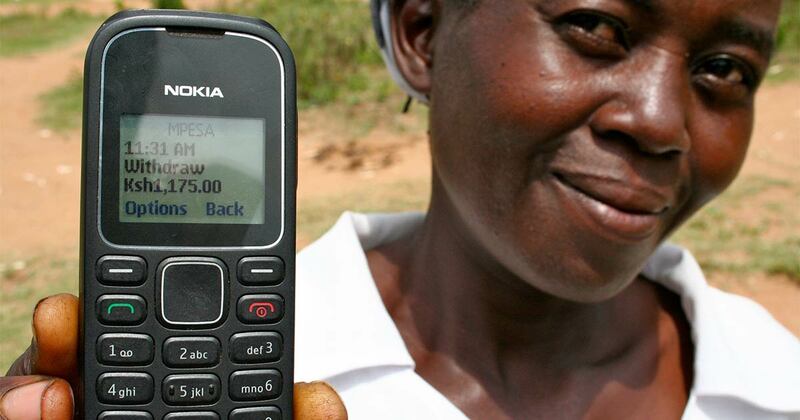 Rather, they are at the center of Africa's revolution in mobile banking, which is crucial to GiveDirectly's strategy. A person in sub-Saharan Africa is 60 times more likely to have a mobile financial account than a European. 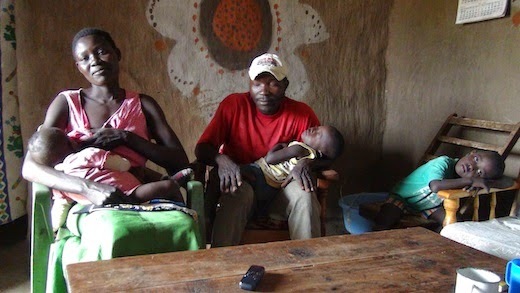 Once GiveDirectly has selected a village based on publicly-available poverty data, it uses an ingeniously simple method to identify who will receive money: it enrolls households who live in homes built with thatched roofs and mud floors (as opposed to corrugated metal roofs or concrete floors). The use of organic materials is a reliable indicator of severe poverty -- easy for members of the community to understand, and for GiveDirectly's staff to audit, the group states. Distributing the money electronically slashes costs and eliminates several prime opportunities for corruption (i.e., fewer middlemen to siphon off funds or ask for bribes). It is at the core of GiveDirectly's plans to scale its work to millions of poor people worldwide. Does giving cash help? Cash transfer programs have an extensive research record, including dozens of peer-reviewed studies spanning at least 13 countries in four continents. The UK's development agency calls cash transfers "one of the more thoroughly researched forms of development intervention"; a gold-standard charity evaluation group GiveWell (not affiliated with GiveDirectly) says transfers "have the strongest track record we've seen" for a non-health poverty program. Longer-term research into anti-poverty interventions is rare, but it exists for cash transfers. A 2013 study in Uganda found that people who received cash enjoyed a 49 percent earnings boost after two years, and a 41 percent increase after four years, compared to people who hadn't gotten a transfer. Another study in Sri Lanka found rates of return averaging 80 percent after five years. In Uganda, not only were the cash recipients better off, but their number of hours worked and labor productivity actually increased. Do many people just end up wasting their money on alcohol or smokes? Last year, the World Bank reviewed 19 studies of cash transfer programs and said the answer is no. “Almost without exception, studies find either no significant impact or a significant negative impact of transfers on expenditures on alcohol and tobacco," the report stated. "This result is consistent across the world." "Almost no men wasted [the money]. In the months after they got the cash, most dressed, ate and lived better. Unlike the Ugandans, however, whose new businesses kept growing, the Liberian men were back where they started a year later. Two hundred dollars was not enough to turn them into businessmen. But it brought them a better life for a while, which is the fundamental goal of any welfare program. We also tested a counseling program to reduce crime and violence. It worked a little on its own, but had the largest impact when combined with cash." There are at least a few health-focused poverty programs that have an even stronger record of cost-effective results, analysts say, including distributing bed nets to halt the spread of malaria and deworming. Also, money alone cannot always overcome a lack of basic social services. Cash recipients spend more on education and health, but if there are no quality schools or healthcare in their area, then try as they might, they do not necessarily end up healthier or better educated. An evidence-based approach to development. GiveDirectly is the first nonprofit to focus exclusively on cash transfers. It was founded by four graduate students at MIT and Harvard. Partly they were spurred by technological advances like mobile banking, which make distributing cash cheaper and more secure than ever. But in Cambridge, Massachusetts, they were also at the heart of a growing movement to put aid interventions to the test of actual science. Esther Duflo is a key leader of this movement. The Financial Times called her "one of the world’s star economists -- tenured at MIT at 29, MacArthur Foundation 'genius' fellow, winner of the 2010 John Bates Clark medal, the so-called 'mini-Nobel.'" One of her mantras is that aid programs can and should be rigorously tested, because when they are, the results are often surprising and do not line up with people's preconceptions. (Exhibit A: the realization that when poor people receive cash, they don't rush out to spend it on alcohol.) In 2003, Duflo and colleague Abhijit Banerjee founded MIT's Poverty Action Lab, which worked on many of the studies documenting the power of cash transfers. 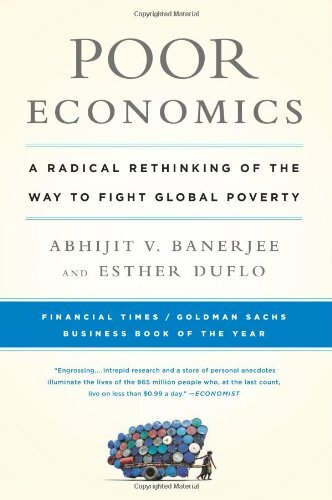 After years of experimentation, Duflo and Banerjee published a celebrated book, "Poor Economics," which combats the idea that poor people live simple financial lives. They found the poor are in some ways even more sophisticated with their finances than wealthier people, partly because it is so important that they get things right. The extreme poor personally manage loans to family and neighbors; they evaluate credit offers without the support of financial institutions; they manage their day-to-day cash flow in the context of very inconsistent income patterns. All of this helps explain why giving cash to the poor, rather than allocating capital on their behalf, has proven particularly effective. Government-run cash programs typically require poor people to take some action before receiving money, such as getting a vaccine. The amounts transferred are usually small and handed out over longer periods of time; they're essentially an income supplement. GiveDirectly takes a different approach. Bolstered by recent research, it distributes a large, one-time sum of cash over a shorter period of time. The goal is to transfer wealth that is more likely to be invested in long-term benefits. 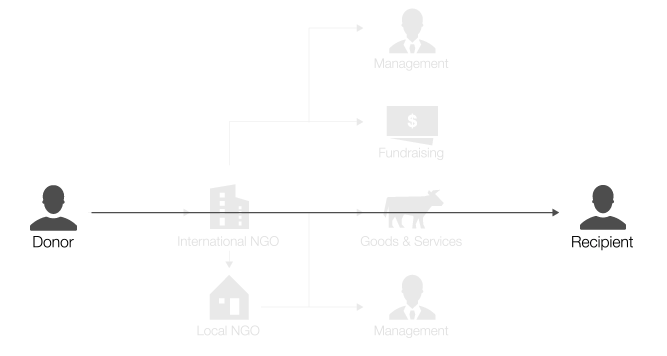 Also, GiveDirectly's transfers are made unconditionally, with no strings attached. The group found that adding conditions (and verifying they were met) provided few benefits, despite substantial costs. So how do people spend their $1,000? "We have seen it all," GiveDirectly co-founder Paul Niehaus told The Huffington Post. "If there’s anything we’ve learned from doing this, it’s that everybody has very unique needs." Often some of the money goes to food, better housing, healthcare or education. "Sometimes things don't work out -- the money goes to a failed investment, a business that doesn't succeed." And then there's everything else. "We had one guy who bought musical instruments and started a band and released an album," Niehaus said. "Anything you can imagine in this incredible richness and diversity of human life." Despite the work of Duflo and others, accountability is not yet a standard of the charity world. Few aid organizations attempt to verify whether their programs are actually effective. Even more rare are nonprofits that submit their own programs to randomized controlled trials (RCTs), the same rigorous types of studies that pharmaceutical companies use to test drugs. These trials are expensive, difficult and time-consuming. GiveDirectly's leaders not only encouraged such a study of their work, but went further. In 2013, they took the extraordinary step (in the charity world) of announcing an RCT publicly before the data were in, thus binding themselves to the findings whether positive or negative. If GiveDirectly's approach didn't work, if the results turned out terribly, there was nowhere to hide. Trying to disrupt the aid world. GiveDirectly has proven especially popular in Silicon Valley, where sympathy is high for people trying to upend an industry using technology and data. Google's philanthropic arm was an early GiveDirectly supporter; Facebook co-founder Chris Hughes sits on its board of directors, and another Facebook co-founder, Dustin Moskovitz, has donated over $12 million through his foundation. "In a private sector company, cost is everything and customer satisfaction is everything," said Michael Faye, another GiveDirectly co-founder. "I don’t think we see that in our sector." And so he's trying to change it. In the traditional model, charities show they are conscious of costs by highlighting how much of their revenue is spent on "services." But there are few standards or requirements (from the IRS or otherwise) about how charities should classify their spending. Nonprofits can claim all sorts of "service" costs that are indirectly related at best, including salaries, office space, or grants to other NGOs. There is no requirement that they itemize these costs, and most don't. GiveDirectly wants to establish a new standard: When a donor gives one dollar, how much ends up in the hands of a poor person? Their answer, which has been independently reviewed, is that about 90 cents of each dollar donated is transferred directly to recipients. This is in the realm of a few other best-in-class poverty interventions. To force a focus on customer service, GiveDirectly surveys cash recipients about their experiences. 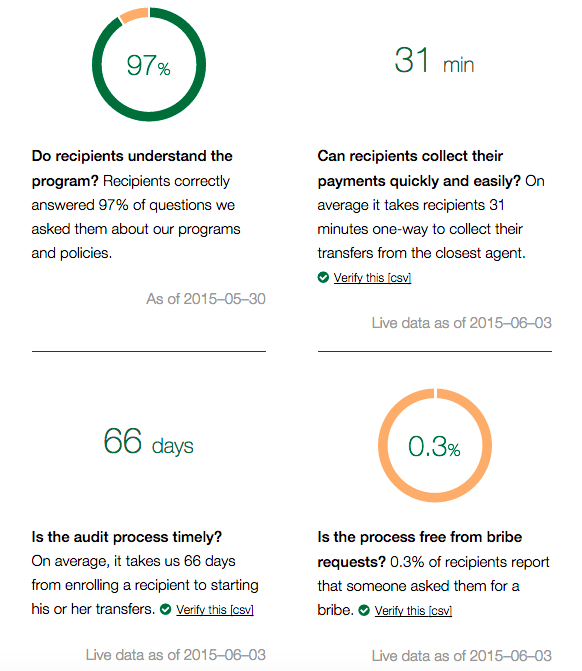 Clients are asked a series of questions -- were they able to pick up their payments quickly and easily? Were they asked for a bribe? -- and their answers are posted publicly on the web, in real time, along with links to raw data tables. GiveDirectly's website is a monument to the organization's data-driven approach. Instead of heart-wrenching photos of children in need, you'll find numbers -- lots of numbers -- that identify whether GiveDirectly's services are hitting its key performance goals. "This means that we could make a mistake and you would see it at the same time that we would," Niehaus said. "We think that’s a powerful standard to set." The group's website does feature personal stories from individual cash recipients, but GiveDirectly says the people they interview are chosen at random. Niehaus described it as a fundamentally different approach to promoting a charity, one based on giving donors an accurate view of the lives of the poor. "This is a real opportunity to disintermediate the way Americans learn about poverty overseas and give them a much more honest and unfiltered view of what that life is like, and what people were able to do with their money." These are often not the glossy tales of hope (or of tear-jerking destitution) that are found in many nonprofit ads. In one interview on GiveDirectly's website, a cash recipient named Kevin shared his initial concern that the program was run by satanists. "We have heard over the radio that in [other places] devil worshipers work in those areas and take money there but later they demand that you offer a sacrifice in the form of your child, your wife, or you personally." In another interview, a recipient named Selyne detailed her thoroughly un-exceptional shopping list: a wooden door, some furniture, a chicken. "We’re not just picking a few stories that make us sound good," said Niehaus. "We’re really giving you a representative view of what happens when you give people cash transfers." Faye added, "We’re going to combine emotion with truth in our marketing efforts." GiveDirectly also wants to provide donors with more hard data. "In the same way you would track a package that’s sent through FedEx, you’ll be able to track your donation from when it goes to Kenya, when we identify the person, when we back-check the person, when the money hits their bank, all of it," said Faye. "Until we enforce metrics and discipline around efficiency, transparency, fraud, our sector is not going to change." Digitization of the aid supply chain provides more data to donors but also ensures more reliable services for cash recipients. It is very difficult for aid groups to closely account for the work of their field staff, who are distributed across large remote rural territories. 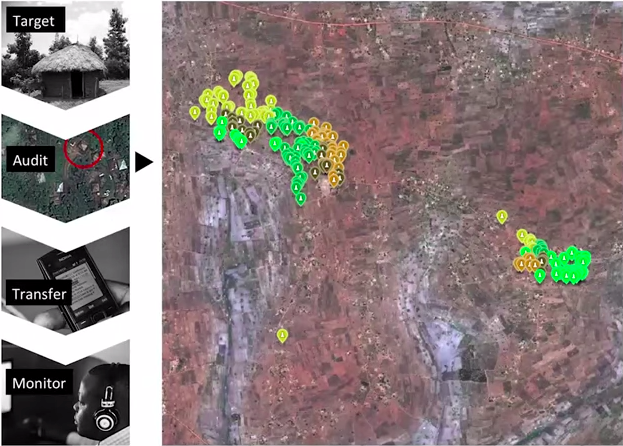 In GiveDirectly's case, all field work is digitally time-stamped and geolocated. When a staffer says they were at a particular home at a particular time, it can be verified. Directors can watch a live data stream as field workers go door-to-door in a village enrolling new cash recipients. Last year, GiveDirectly faced its worst case of fraud to date: roughly 2 percent of one month's round of payments was stolen. A GiveDirectly director in Uganda had colluded with the local money agent to convince recipients that part of their cash was being withheld to cover higher costs of SIM cards. Some recipients were suspicious and called GiveDirectly's local helpline, but the call center staffer was in on the scam. The incident came to light publicly when Niehaus wrote about it on GiveDirectly's blog. "It was a tremendous opportunity to set that precedent," Niehaus said, "that we’re going to be transparent about things that go well and also about things that don’t." "We want to go to great lengths to talk about our failures, to talk about the incidents of fraud that GiveDirectly experiences," Faye added. "This is inherent to the sector and for too long we’ve avoided talking about it, which means that people simply pretend that it doesn’t exist. Until we can have an honest conversation and say, 'Yes we had high costs,' or 'Yes we had fraud,' we’re not even going to start down the path of fixing it." This is music to the ears of Elie Hassenfeld, a hedge fund analyst turned charity evaluator who helped create GiveWell, which does meticulous work to identify the most effective and cost-efficient groups working on extreme poverty. GiveWell typically names only three or four top charities each year; GiveDirectly has made the list for three years running. "We look for organizations where if something goes wrong, they would know about it, and they would highlight it, and they would learn from it," Hassenfeld told HuffPost. "If you're hearing some bad news, that's a good thing. If you're only hearing good news, that's a bad thing. You should hold organizations accountable to that standard rather than a totally unreasonable one of perfection." The results come in. GiveDirectly had announced the first rigorous trial of its own program before the data were in, results be damned. Now the study was published and the conclusions were striking. Investigators found that, one year after the transfer program, cash recipients had increased their earnings by 34 percent and their assets by 52 percent compared to people who didn't receive transfers (the new assets were most often livestock, household upgrades, and savings). Among cash recipients, the number of people who reported going to bed hungry dropped by 36 percent, and the number of days children went without food fell by 42 percent. Cash recipients had spent more on education, health, food, and social goods and activities (though after a year, health and education outcomes had not changed substantially). There was no increase in alcohol and tobacco spending. The trial also measured the psychological effects of GiveDirectly's cash transfers. Lead investigator Johannes Haushofer, a behavioral economist at Princeton, studies the intersection of poverty and psychological well-being. He has written of a "psychological poverty trap": being poor causes stress, anger, and sadness, which are in turn linked to economic problems like lost productivity and reduced interest in long-term investments (like health and education), which in turn exacerbate poverty. It can be a vicious cycle. Participants in the GiveDirectly trial were given a range of tests assessing well-being and happiness; researchers even took saliva samples to measure the stress hormone cortisol, the first time this has been done in poverty research at large scale. The resulting data showed "large and highly significant increases in psychological well-being among transfer recipients." People who received cash said they were happier, had greater life satisfaction, and experienced less stress and less depression. Notably, it didn't matter if someone started off with low or high psychological well-being -- all experienced similar improvements after receiving cash. Researchers also found that cortisol (stress) levels were significantly lower in several circumstances, and stress decreased more when more money was given. That cash recipients can spend their money on anything has made evaluating transfers trickier. Is it more important to see improvements in health or in education? "We have this conversation all the time," said Faye. "It’s a very hard question to answer. You take two neighbors and one needs to send their kids to school and one needs surgery because they’ve had a long-standing illness." A benefit of evaluating psychological well-being was producing a metric that could sidestep this debate: a single composite measure of the impact of cash transfers. Though people spent their money in highly personalized ways, they were all on average significantly more satisfied with their lives. Next steps for cash. GiveDirectly still faces uphill struggles. Many in the United States remain skeptical of giving cash to poor people. "The debates we’re having when we talk with American donors are miles away” from where development experts are at, Niehaus said. The reluctance is not limited to donors. Last year, when a wealthy Chinese financier publicly offered to fund $300 cash payments to homeless New Yorkers, the New York City Rescue Mission refused. Its executive director said he feared the payments would be spent on drugs and alcohol. Also, few established charities have adopted the accountability measures that GiveDirectly advocates. At least one has argued against them. Heifer International is a large U.S. nonprofit that provides cattle and other livestock to the poor, among other programs. In 2013, when NPR asked whether Heifer would submit its programs to a controlled study, the group's vice president of Africa Programs said it was a terrible idea. "I mean, it sounds like an experiment, and we're not about experiments," Elizabeth Bintliff told NPR. "These are lives of real people and we have to do what we believe is correct. We can't make experiments with peoples' lives." Searching "fraud" on Heifer's website brings up zero results. The group's homepage does tout a 2009 study which found that Heifer’s work benefited poor rural families. But the paper has never been published or publicly released, and one researcher who was shown portions of it said he was asked to sign a non-disclosure agreement. Two weeks ago, however, Heifer's president and CEO Pierre Ferrari announced, "Heifer International is currently engaged in a randomly controlled trial (RCT) project, and I look forward to sharing the results as they become available in the future." And despite some skepticism, GiveDirectly's financial support is growing (from $5.5 million in 2013 to an expected $40-50 million this year), driven in large part by younger donors working in tech or finance, according to Niehaus. "These are people who are used to quantitative approaches and who really care about evidence. They want to go to a nonprofit website and read about, Here’s how we’re doing on fraud. We’re just really pumped to have a donor base that appreciates that and values the honesty." Some of the giants of the development world are embracing cash transfers. The United Nations' World Food Program is among the largest humanitarian agencies, with annual funding of over $4 billion. As recently as 2009, only $10 million was spent on cash and voucher programs. That number has since soared and in 2014 was estimated to exceed $1.25 billion across 87 programs in 56 countries. GiveDirectly is leveraging its data to help improve transfer programs carried out by others. It has again publicly pre-announced new RCTs of its work, including one ambitious study of how cash transfers impact communities at a macro-level. "We’re asking questions like, what happens to the structure of businesses after cash transfers? How does local government change what they do? How do schools reallocate their budget? What happens to the prices of goods?" Niehaus said. "These are the sorts of questions that finance ministers have." No one argues that all anti-poverty spending should be shifted to cash transfers. There are other critical forms of development aid that do things cash transfers can't, like provide public goods (vaccines, health clinics and roads, for instance) or transfer knowledge and skills. But supporters believe that cash transfers should now be the standard against which the usefulness of other programs are measured. As Facebook co-founder Dustin Moskovitz put it when announcing a $5 million donation to GiveDirectly: "Instead of asking the question 'should this project be funded or should we do nothing? ', we could be asking the question 'should this project be funded or should we just give the beneficiaries the money?' and now we have that opportunity." Nico Pitney is an executive editor at The Huffington Post, based in San Francisco. Transcription services by Tigerfish; now offering transcripts in two-hours guaranteed. Using transparency and data to improve aid work is part of an emerging movement called effective altruism. Learn more from the TED Talk below by ethicist Peter Singer, or check out Singer's new book on effective altruism, "The Most Good You Can Do."